Without possession, both sides shared distinct similarities in their defensive strategies as they looked to use man-orientations in their pressing to look to disrupt each other’s possession game. Inter took on more strict man-marking responsibilities than their opposition and would follow the Napoli defenders quite closely when pressing their build-up. Then, as is the case with man-marking, it led to Mancini’s side not often maintaining a clear shape as it was largely determined by the movements and positioning of their opposition. In doing so, the away side immediately gave Sarri’s men the opportunity to create structural instability which, albeit wasn’t exploited to the greatest extent, displayed the weaknesses of man-marking. Aside from this, there were also very simple errors on show in Inter’s man-oriented pressing. In many instances through the 1st half the pressing players simply didn’t work together to cover a free player which often left gaps which Napoli were happy to fill. 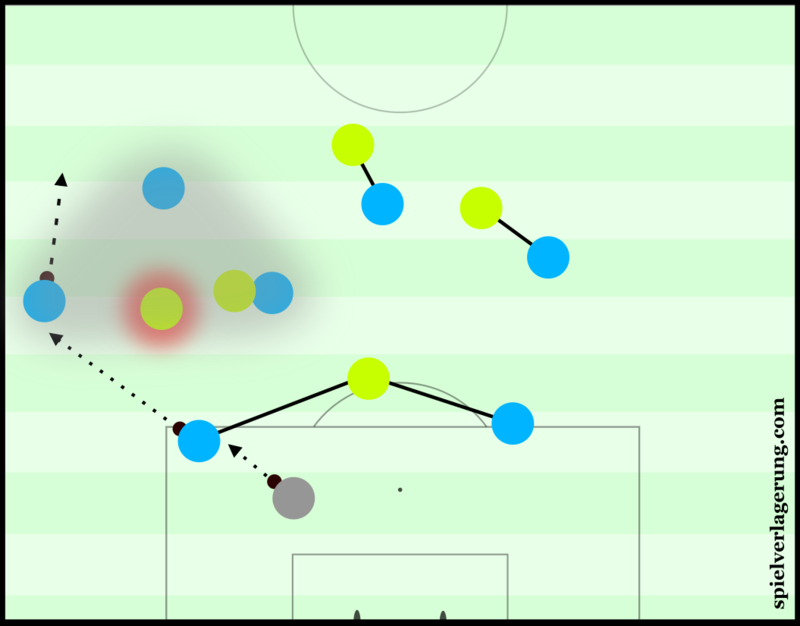 This was most often the case between Medel and Kondogbia who both failed to cover the movements of Mertens and Callejon when they would drift inside. During these cases, the man-marking showed its inability to react to an attacker becoming free as the nearby defenders were occupied with their own marking responsibilities. Another case of Inter’s poor pressing. In the above example, Reina is content to roll the ball to Koulibaly whilst Inter are stood still, seemingly happy with their defensive positioning despite the right not being strong at all. Koulibaly can receive without pressure and turn to move towards the left, where he makes a simple pass into the left-back and Inter’s press is broken immediately. Biabiany cannot recover a strong defensive position well enough and Napoli can drive forward past him with the ball. On the other side of the game, Inter were also quite poor in their build-up of possession. They struggled to play against Napoli’s flexible man-marking and rarely managed to move the ball into the midfield effectively. The midfield pairing of Kondogbia and Medel were fairly static and would often stay on the same vertical line which created some clear issues in their spacing across the shape. With a fixed double 6 pairing, the centre-backs usually only had one clear passing option as the ball often went through wider areas and Napoli could then cut this off with relative ease. With that being said, the pairing became more flexible in possession as the game progressed, with Medel particularly benefiting with a greater influence. They staggered their positioning much better which improved the passing options into the centre and Inter benefited by having greater access to the middle of the pitch. In higher up areas, Inter caused themselves issues in their attacking tactics as they were fixated quite significantly around moving through wide areas with Biabiany and Perisic seeing a lot of the ball. They lacked any real dynamic and were fairly predictable with Ljajic only shifting horizontally between the half-spaces and Perisic not often leaving his area on the left flank. Biabiany created some of the most promising moments when he drifted inside into the right half-space but this wasn’t often and otherwise he too would stay close to the touchline. The side moved the ball most commonly through the right flank, where Biabiany would be the focal point as Inter looked to find him on the end of through-balls. However he most often received in a static body position with a pass to feet and without any nearby support, the attacks were usually individual runs at the defence which were unsurprisingly ineffective. Then on the left, Perisic was even less variable and rarely moved away from the touchline. From this position he was limited to a few linear attacks with direct runs at the defensive line which, similarly to the attacks on the opposite flank, had limited potential. Between them drifted Adem Ljajic who himself struggled to influence Inter’s attacks in the final third. The on-loan forward from Roma would generally shift between either half-space in some ball-oriented movements which are quite common of an attacking midfielder in a wing-focused 4-2-3-1. Despite his movements towards the wider areas however, he never really managed to integrate either winger, with the only dangerous attacks being developed when Biabiany came inside to him and they could combine centrally. His weak integration of the wingers seemed to stem from a positional issue, as he often took up a weak position in relationship to that of Biabiany or Perisic. The attacking midfielder would rarely be positioned well enough where he could provide a good inside option for the winger and as a result, the majority of wide attacks had little means of moving inside. From around the 35th minute onwards, Jovetic progressively started dropping deeper into each half-space which provided some benefit as it provided better ball-oriented support to the wing players. In comparison to Inter’s struggles, Napoli were somewhat better in their development of possession with them having better synergy in the movements and combinations, especially in the first half. This was key in beating Inter’s man-oriented press as they could use quick combinations to get ahead of their marker before the pressers could anticipate and react in time. They could generally move the ball into the midfield well enough against Inter’s pressing however their issues came after this stage. Resting several key players such as Higuain and Insigne, they lacked attacking synergy amongst the front three and ultimately struggled to gain access into the centre. This problem lied on multiple levels, as their positional structure wasn’t usually good enough to receive the ball into the 10 space initially let alone to develop combinations afterwards. Napoli’s passing to penetrate Inter’s midfield line was also quite weak with a lot of misplaced vertical passes being made which were intercepted by the double 6 pairing. When they did manage to find the ball within the 10 space, there was a distinct lack of harmony between the attackers’s movements off of the ball. Without their combinations being at the usual high level, they struggled to maintain possession in dangerous areas and their attacks very quickly broke down after the ball got in between the lines. The attacking troubles of Sarri’s side were epitomised through the 2nd half as the forwards started attempting extremely wishful long shots after they had struggled for the past 60 minutes to break through Inter’s defence as a collective. With the likes of Insigne and Higuain rested to the bench, one has to think that the home side’s rotation had a sizable influence on their lack of synergy in the final third. In summary, we saw quite a poor match despite it being a clash of two of the top Italian teams. Napoli were sub-par as Sarri rested multiple players which resulted in their possession game suffering considerably. Mancini’s side were also weak with the ball and managed to score 2 goals from their 3 shots on target. In particular it was their wing-orientation which led to linear and individual attacks possessing limited potential in the final third.